In the NFL, what constitutes as a rivalry? At the college ranks it's fairly obvious - you play each other just about every year, your schools are typically close geographically, and the students consume extra alcohol when the other school is on the schedule. In the NFL, and in all professional sports leagues, the rivalry lines are typically blurred. Outside of your own division it is rare to see a team often enough to develop a "hatred." It's also rare to play a team during enough of your franchise's defining moments to have a series of memorable games against one another. I don't know if I'd call what the Dallas Cowboys and Seattle Seahawks have a rivalry, but they certainly share their fair amount of recent history. Week two of the NFL season, a season which opened with a Dallas Cowboys victory over the rival New York Giants. It was another one of those Tony Romo/Eli Manning battles, in which Dallas went on the road and defeated the defending champions on their ring night. Things felt good for the Cowboys, and fans were believing this was the year they took the leap from 8-8 to double digit wins and division champs. Then you had the Seattle Seahawks. Seattle hadn't been all that impressive in recent years, and they were starting a rookie quarterback in Russell Wilson. They weren't expected to be better than the Cowboys that season, but on that day in 2012 it could be argued an NFC power was born. 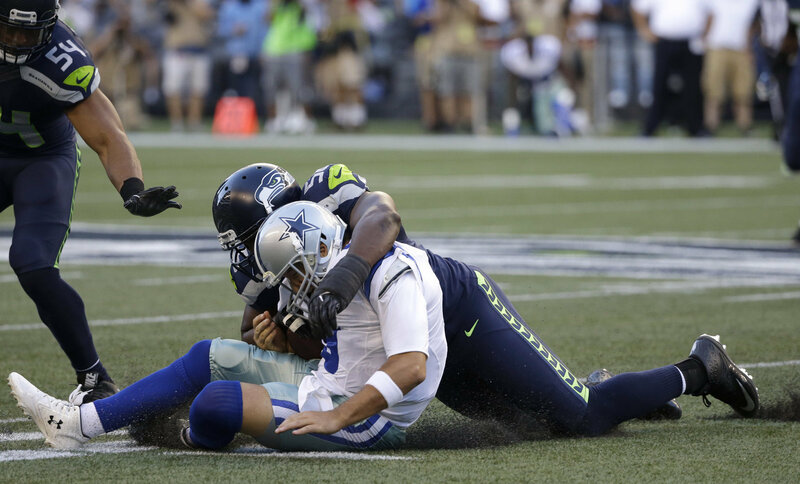 The Seahawks absolutely smoked the Cowboys, embarrassing them and defeating them 27-7. It was the type of loss that forces you to re-evaluate everything you have going on within your franchise. Seattle went on to beat Washington in Wilson's first ever playoff game, and would win the Super Bowl just one year later. In some ways the roles from 2012 were reversed. While the Cowboys were off to a hot start none of the national media was ready to admit they were a legitimate contender. They thought for sure that when Dallas went back to Seattle for the first time since they were decimated in 2012, the Cowboys would be exposed as frauds. Instead, the Cowboys punched the defending champs in the mouth right in front of the vaunted 12th man. DeMarco Murray and the Cowboys offensive line controlled the game, while Tony Romo made some critical throws when needed in order to get the win. It was the game which validated the 2014 Cowboys to many and made people believe in what head coach Jason Garrett and company were building down in Dallas. But then there was the 2016 preseason. It was supposed to be a fun day. The debut of first round running back Ezekiel Elliott and our first extended look at quarterback Tony Romo since his season ending injury in 2015. But on the very first drive of the game defensive end Cliff Avril dragged Romo down from behind and changed the course of the Cowboys forever. Once again, both the present and the future of the Dallas Cowboys were changed against the Seattle Seahawks. Dak Prescott entered the game in relief of Romo, and to the surprise of everyone, he never left. Prescott is now the franchise quarterback of the Cowboys, and without that Avril hit it is fair to wonder what the team would look like today. This week the Cowboys play yet another defining game against the Seattle Seahawks - Ezekiel Elliott's return from suspension. With both teams at 8-6 this Sunday is virtually an elimination game, and is just the kind of game which could propel the Cowboys to one of those magical postseason runs. Of course, there is a lot that has to happen between now and then for this to be the case, but it would be nice for Dallas to create some positive memories against Seattle for a change this Sunday.